Sister Kovida’s recent teachings at The Hamblin Hall, Bosham House are now available to listen online or download to your computer or MP3 player. Click Ajan Kovida or go to the Audio page to your right. 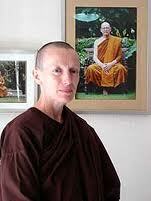 Ajahn Kovida gave several teachings at the Hamblin Hall on meditation and being present. She talked with great clarity and insight on becoming aware of our habitual prosesses and refining our attention. Sister Kovida also talked about many issues including the transition between activities, be they sitting quietly, conversing with another, standing and walking, all the activities we encounter in daily life. How do I react, when do I react and just letting it be; let come, let be, what happens next? It’s your discovery! There are many audio teachings available on this page including Ringu Tulku Rinpoche’s teachings to BBG Bosham, Chenrezig puja and the prayers we recite at each meeting. This entry was posted on May 28, 2011 at 7:33 pm and is filed under Buddhist meditation, News, Programme, Ringu Tulku Rinpoche, Teachings. You can follow any responses to this entry through the RSS 2.0 feed. You can leave a response, or trackback from your own site.